The Cape Town Environmental Education Trust says they’re doing all they can to protect a herd of Eland from illegal hunting. The City of Cape Town has urged the public to be on the lookout for suspected illegal hunters in the Cape’s nature reserves. Illegal hunting of animals like the Cape Hare and Grysbok are placing them in danger of becoming extinct locally. 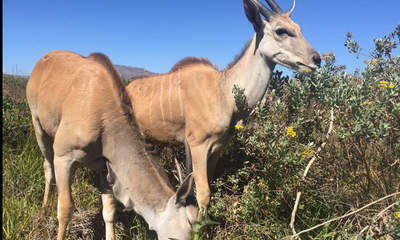 The Trust’s Petro Botha says they are doing all they can to protect five young Eland who were reintroduced back into the Zeekoevlei Nature Reserve last month which borders next Marina Da Gama. It’s hoped the Eland that last roamed the Cape’s natural areas 200 years ago, will prevent vegetation encroachment.